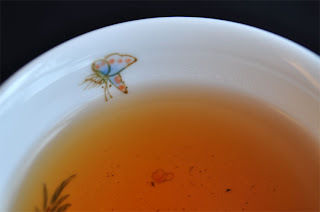 A kind reader sent me a sample of a 'mid 1960s sheng loose puerh'. 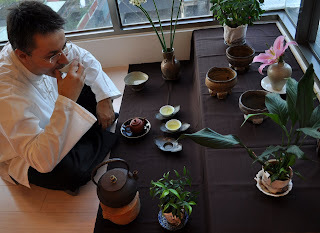 Such an old puerh is supposed to taste divine. After a rinse and 2 brews, it didn't feel clean and smooth in the mouth and along the throat. I decided to stop brewing it and switch to my early 1970s raw loose puerh. 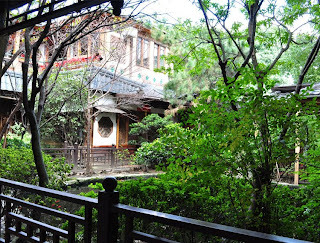 The dry leaves and the smell are very similar. The big difference between these 2 teas are the wet leaves. After 2 brews, I fished out some from the teapot for comparison. See Above. Can you guess which is really sheng? The mouthfeel of my early 1970s is completely comfortable and, 3 hours after drinking it, I can still feel the sweet and powerful aftertaste. 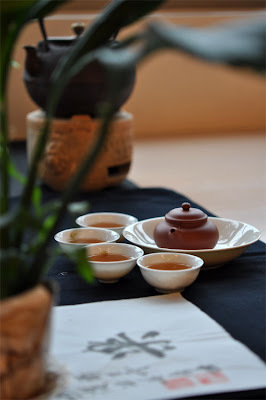 Yesterday's Cha Xi is also a good fit for my zhuni teapot and qinghua porcelain. The zhuni and the brew bring a warm touch to a sea of blue. Now that the tea in my tea cup feels right and delicious, I can switch my mindset from critical and investigative to happy and thankful. 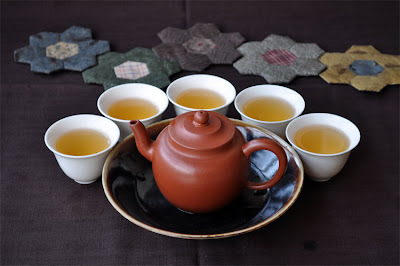 With tea pleasure, my mind is set free and can enjoy all aspects of my Cha Xi. For instance, I can enjoy the peaceful harmony of this black glazed bowl made by hand by my friend Michel. 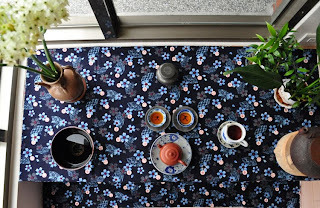 - The black leaves on the right are typical of shu puerh ; however, not all shu puerh is as black. Sometimes, the wo dui process is shorter or lighter and doesn't result in such a level of dark color. 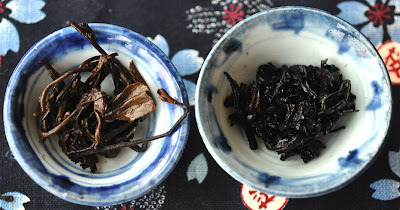 - The sheng leaves on the left show leaves with varying colors and darkness. The leaves and stems with most moisture will turn darkest over time (in the humid climate of Asia). 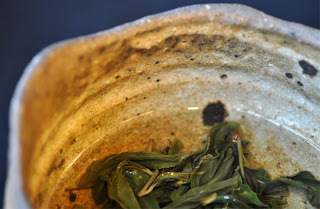 Seeing a portion of black leaves is normal and doesn't necessarily mean it's a mix of sheng and shu. (A pure taste will say if it's a mix or not). - 30 years ago, the manufacturers would have recipes and use different grades, different kinds of leaves in their production. That's why it is normal to see very diverse leaves. Having very similar leaves is a modern trend. 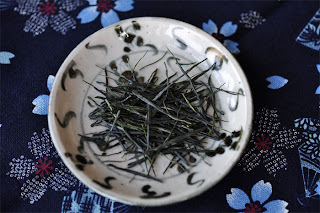 Ambiance japonaise pour ce thé vert du Japon. Sa particularité est visible dès les feuilles sèches. Elles forment de longues tiges entières. Travaillées et pétries à la main, le résultat est très soigné. Pour les infuser, j'utilise mon petit gaibei (zhong) qingbai et une eau minérale que je laisse exceptionnellement refroidir un peu. Pour boire, j'ai choisi mes tasses chantantes qingbai pour leur finesse et pour rehausser la couleur pâle de l'infusion. Avec mes Bei Dian (chataku), je reste dans le style nippon. La jarre en étain provient aussi du pays du Soleil Levant et conviendrait bien pour conserver la fraicheur de ce thé vert. 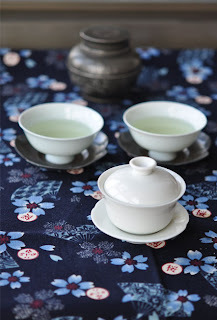 Le vert clair offre un joli contraste avec le bleu foncé de mon Cha Bu. Il peut paraitre un peu chargé vu de loin, c'est pourquoi j'utilise de la porcelaine unie. L'effet final me plait bien de près. Un vent frais et printanier semble souffler doucement. Au nez, on retrouve les caractéristiques marines et végétales d'un Shincha. C'est un peu plus fin et moins fort. Le goût est plus léger et presque sans astringence. Cette finesse rappelle le thé vert (entier) chinois! Je remercie un lecteur de m'avoir fait découvrir ce thé. (Vielen Dank Kim!) La moindre des choses était que je partage cette découverte avec vous tous! Et pour en savoir plus et voir comment ce thé est fait, je vous recommande cette vidéo. 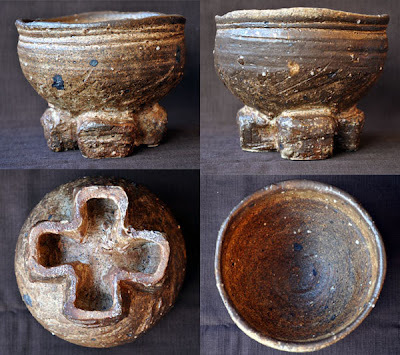 The 3 bowls I'm presenting here were made by David Louveau de la Guigneraye. He is a French potter who works with natural clays (Earth) and 2 wood and a gas kilns (Fire). This first unglazed bowl was fired with gas. It looks a shiny and the touch is rough and hard. The large foot reminds me of a Tai Chi's sculpture by Ju Ming. It has a very martial and powerful spirit. 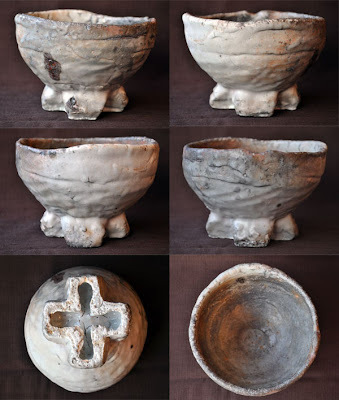 "The 'Hal Gu Dae' style, which originated in sixteenth century Korea, is a very difficult style to pull off and, perhaps for this reason, is rarely attempted by the master potters of today. It is characterized by its famous eye-catching foot and the balance that it creates with the main body of the bowl. 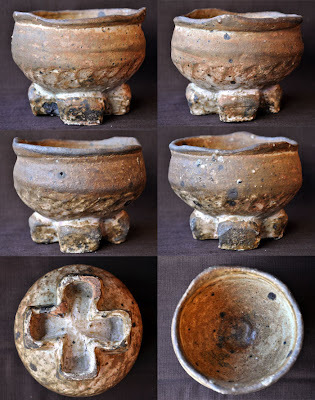 The original 'Hal Gu Dae' foot has four protruding extensions forming a hollowed-out cross that can be seen on the very bottom of the foot if you flip the bowl over. This style of foot has a inclination to overwhelm the grace and naturalness of a bowl. The challenge is to make such a monstrous and pompous foot look harmonious, natural, and more modest- not as easy as it sounds." This second bowl (above) was glazed (white) and wood fired for 2 days and then got another 3 days of rest to cool down. It came out of the kiln on August 5, 2009. 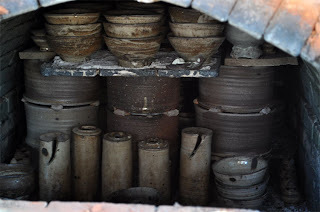 (The picture was taken after reopening the kiln). You can see the very top of it below in the middle of the picture left. It stood just right in front of the main fire. That's why one the sides facing the fire and the inside are so dark. Its surface tells a story of suffering and resistance. It received the full strength of the fire and lots of ash deposits. The red colors one sees here and there are like fire on ice. Its touch is cold and smooth, but not entirely. This bowl has a wider shape and its feet were shrinked at the base. Thereby, the feet appear smaller. This is also emphasized by the light color. This last raw (unglazed, except near the foot) Al Gu Dae bowl was wood fired together with the one above. You can see it below on the far left of the picture in the kiln. It looks the most natural and its touch also feels much smoother than the gas fired bowl. I would almost say that this one feels like wood while the gas fired bowl feels metallic. The bowl closes before it opens again at the rim. This allows to hold it very comfortably with both hands. Overall, this feels and looks the more harmonious of the three. 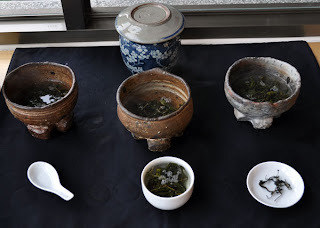 One of the reasons I brought these 3 bowls back to Taiwan is to study how to differentiate the firing methods and see how they impact the taste of tea. (I've also used them in my Cha Xi for aesthetic purpose). Nowadays, almost all modern tea accessories one can find are gas fired. Wood is a much more expensive heat source. It's very difficult to control. Is it just a gimmick to be different or to follow the traditional methods for nostalgic reasons? Or does wood firing have an impact on the taste of tea? I taste more sweetness than with the porcelain, but also some astringency and bitterness after several seconds. The aftertaste somewhat feels stuck at the back of the mouth. But it has a nice power. 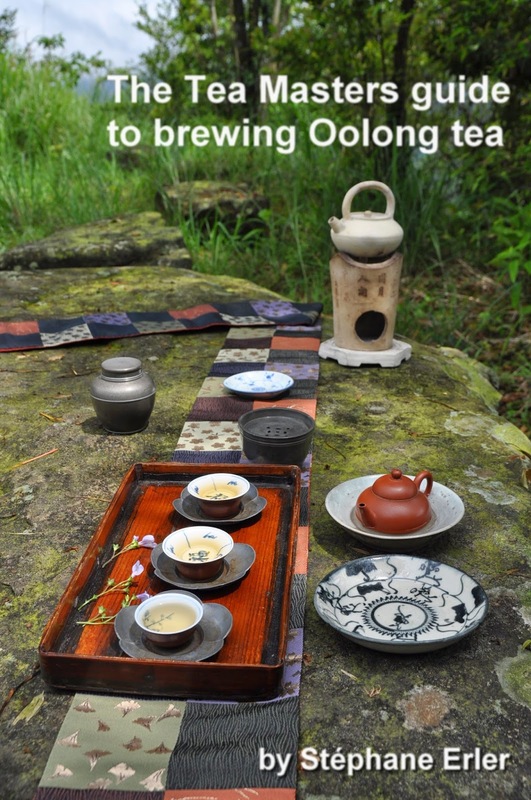 The tea also tastes more 'qing' or raw, not so easy on the stomach. The tea tastes finer, more natural and lighter. The porcelain competition cup tastes rougher, more immediate. This one takes a second or 2 more to appear and does so with more grace. Sweet. 3. Unglazed and wood fired. The tea tastes fine, light and like filtered. No 'qing', raw taste from this bowl. The tea slides easily down the mouth and throat. No astringency or bitterness. The tea is one and pure. This was already quite a pleasant surprise. Even better is the long mellow aftertaste. It fills the whole mouth again with recurring tastes and fragrances. 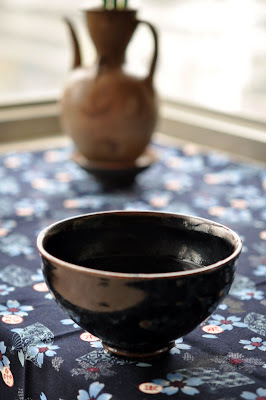 I have repeated this test with Qizhong Oolong and even with a potter in Yingge. Each time, this unglazed wood fired would perform better than the gas fired bowls. No wonder then that antique accessories (all wood fired) have something that modern pieces lack. It's not just aesthetics. The natural wood fire and clay remain true and close to nature. Tea interacts better with such material. My lily flower is blooming and it feels like spring today (25-27 degrees Celcius). 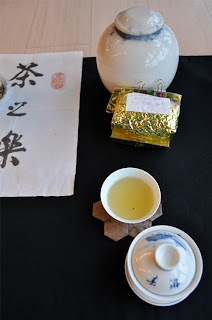 After a cold week drinking roasted Oolongs and older puerhs, I crave my spring High mountain Shan Lin Shi Oolong. 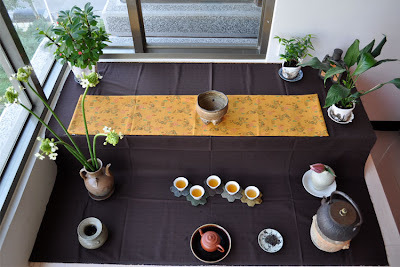 For my Cha Xi, I switch to my qingbai cups, use my zhuni (Xmas gift) teapot and display 3 of David Louveau's "Al Gu Dae" bowls. 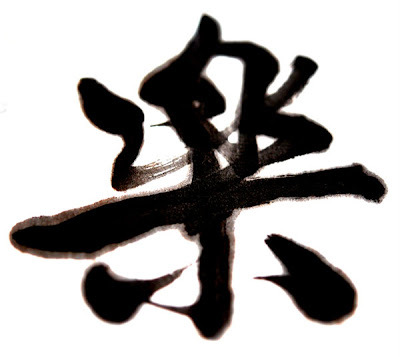 The fact that there are 3 goes back to the calligraphy of mountain (山 in Chinese) that uses 3 peaks. Each bowl is different: the left one is gaz fired, the one is the middle is raw wood fired and the one on the right was glazed and wood fired close to the fire. 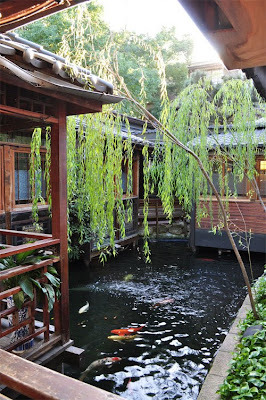 Diversity (water, pine wood, bamboo) is also a characteristic of Shan Lin Shi. The major risk with this tea is to use too much of it. It is very powerful and concentrated. A layer on the bottom of the teapot is enough. Then it's possible to let it brew in a relaxed manner, for long time, and extract all its spring flavors. Surprisingly they are both thick and light, deep and smooth! Strength and purity! The sweet pleasure is immediate and goes on and on. Le weekend dernier, j'ai découvert cette maison de thé traditionnelle dans le marché de nuit de Banciao. Quelle beauté! A la place, je vous propose ce Cha Xi récent. 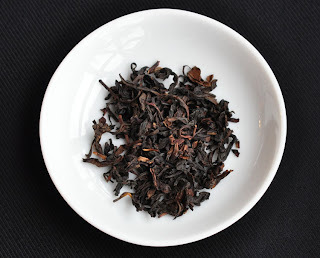 Galette de puerh cru sauvage d'Yiwu de 2003. Un régal. 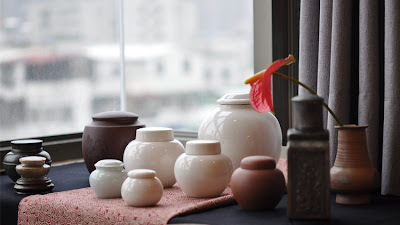 - The porcelain jar has the most intense fragrance, but it seems also more oxidized. - The zisha clay jar has a weakened smell. I also smell some faint roasting, probably a remain from a previous heavy roasted Baozhong I used to store in it. - The pewter jar smells greener and a little asleep. Maybe also a little bit metallic and finer. - The tea from the porcelain jar was more intense in fragrance. - The tea from the zisha clay had some bitterness in the aftertaste. 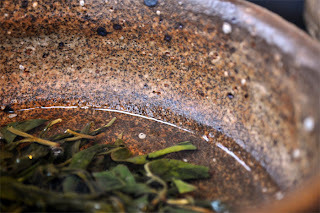 - The tea from the pewter tasted a little lighter and fresher, more like green tea. It's difficult to draw definitive conclusions at this early stage, except that the clay jar was not a good fit for this tea. 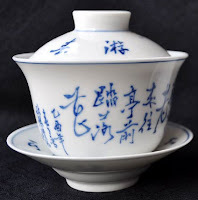 The porcelain and the pewter jars had slight different impacts on this Baozhong. I will continue to monitor the changes over time. 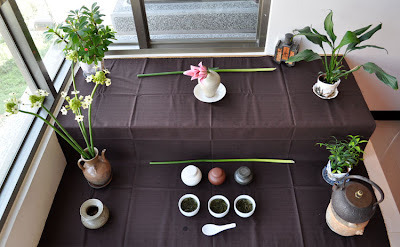 For this Cha Xi, I put a ... lily flower, of course, in the middle of my setup. 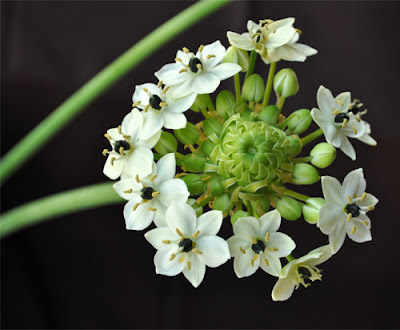 It is surrounded by other plants and flowers (like in a forest). The fabric is dark brown, earthlike, for a very natural feeling. The 2 levels add a mountainous atmosphere to this scenery. Enfant, chaque année, un peu après Noël, je prenais une photo de tous mes nouveaux jouets et cadeaux. C'était ma façon de garder un souvenir condensé de la plus belle soirée de l'année! Dans cet esprit, j'ai rassemblé dans cet article les cadeaux en relation avec le thé que j'ai reçus (ou me suis offert) cette année. 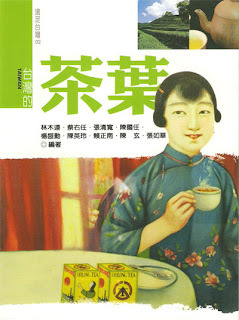 Commençons avec ce livre en chinois, 'Cha Ye', qui donne un bon aperçu du thé à Taiwan. Ses auteurs sont des chercheurs du centre de recherche sur le thé de Taiwan. Il traite d'histoire, de biologie, de production, de dégustation, de géographie, de santé et même du marketing du thé! C'est un bon ouvrage généraliste, mais écrit par des spécialistes indépendants. Pour accompagner mes Cha Xi, ma musique préférée est chinoise et mon instrument de prédilection le Gu Qin. Cet album contient 3 CD. La musique est lente. Elle sait prendre son temps. Elle résonne comme une conversation intérieure. C'est presque de la méditation! Elle chasse les mauvaises pensées, ralentit le rythme de la vie et met l'accent sur le présent. Ce coffret-ci est de la musique Nan Kuan ('Vents du Sud') de l'ensemble Han-Tang Yuefu. Fondé en 1983, ce groupe cherche à préserver cette musique ancienne (dynastie Tang) et de montrer son rôle et son impact sur la musique chinoise traditionnelle. Cette musique si ancienne a le don de me transporter dans le passé. 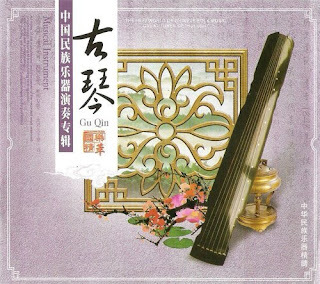 La flute y est très présente, mais on la joue un peu comme du Gu Qin, de manière très lente, fluide et douce. En plus, on ressent le travail de composition artistique. Chaque CD est un album avec une histoire (d'amour) interprétée en plusieurs mouvements. Il y a donc une progression et l'on ne passe pas d'un morceau à un autre sans harmonie. Ainsi, le 3eme CD (que j'écoute actuellement), s'intitule 'La rançon d'amour'. Durant le règne de Jiajing (dynastie Ming), une jeune courtisane nommée Zhenfenger promet d'épouser Zhang Yinlin si celui-ci parvient à réussir le concours pour devenir mandarin impérial. Cette place lui donnerait assez de revenus pour qu'il puisse la racheter à son maitre. Leur amitié est platonique. Zhang Yinlin va à la capitale et est accepté, mais doit rejoindre son poste sans avoir l'occasion de parler avec Zhenfenger. Trois ans s'écoulent durant lesquels elle refuse de toucher les clients. Son maitre est furieux. Il prévoit d'inviter un riche marchand et de la forcer de passer la nuit avec celui-ci. Zhenfenger a vent de ce plan, parvient à s'échapper et à retrouver Zhang Yinlin. Celui-ci peut enfin payer la rançon et se marier librement avec elle. Mon dernier cadeau, et non des moindres, est cette théière en zhuni de couleur orangée. Ses formes sont harmonieuses et généreuses. C'est la seconde théière Yixing de collection que je m'offre. Cela semble contredire mes conseils pour ces fêtes. 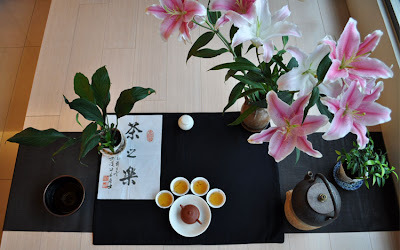 En effet, plus généralement, si l'on s'intéresse au thé, mieux vaut commencer par le déguster en zhong. On obtient alors les résultats les plus vrais. Les théières sont ce qu'il y a de plus difficile à comprendre dans l'univers du thé. L'interaction entre la théière et le thé est complexe: glaise, forme, cuisson... En plus, les théières chinoises sont l'objet de tant de copies. Mais, après 7 ans d'études et de pratiques quotidiennes du thé, je pense être en mesurer le 'plus' que cette théière apporte par rapport aux autres. Ce n'est pas la joie de la voir ou de la posséder, mais celle de s'en servir! Maintenant, on s'amuse, elle et moi, à regoûter à mes thés et découvrir ceux qu'elle infuse le mieux. 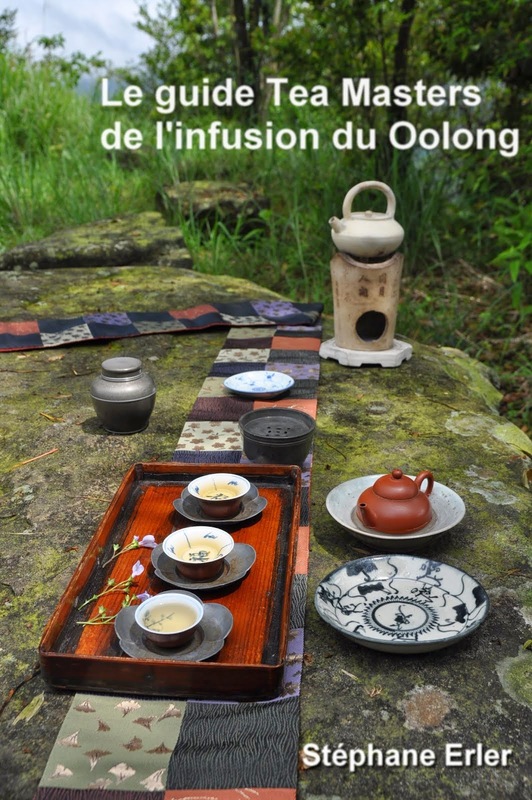 Je lui ai déjà découvert un don pour adoucir la torréfaction des Hung Shui Oolongs tout en conservant et purifiant leurs intenses arômes. 2 years ago, I stored approximately 500 grams of lightly roasted winter Lishan Oolong in a porcelain jar. The leaves that didn't fit in the jar were kept in a vacuum sealed plastic bag (the golden bag in front of the jar). I wanted to keep it closed for another 2 years. But my recent experimenting with storage made this jar too tempting not to check. Also, I remembered I had left the plastic foil under the lid. So, this would also be the opportunity to remove it, in light of my recent tests. 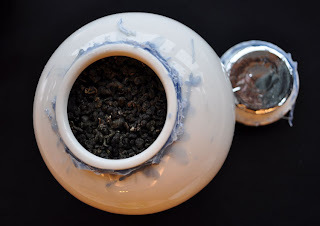 So, how did the storage impact this Oolong? 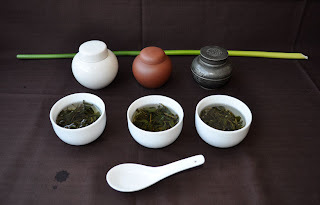 To find out, I smelled the dry leaves and brewed leaves from both the jar and the bag with my gaiwan. The tea from vacuum sealed bag have better preserved its freshness and fine osmanthus flower scents. The tea from the jar, on the other hand, feels a little bit more aged, darker and less intense in fragrance. The difference isn't very big, after 2 years of storage. I would have expected a bigger difference, given what I noticed on just 1 day of storage in my last article. In terms of taste, I feel not just refinement, but also a little weakening. Maybe this is caused by the plastic foil under the lid or if it's the normal evolution of leafs over time (or both). A certain loss of strength is to be expected. That's why it's important to choose a very concentrated tea for aging. That's one of the reasons I had chosen this roasted High Mountain Oolong in the first place. I have taken the foil away and placed the lid on the jar. According to Teaparker, this is enough protection for the leaves, if the jar is in a place with no air flow (or he also suggests to wrap the top with a cloth). "Don't keep the jar open too long when you're getting your leaves", he recommended. Well, we'll see how this plays out over the next 2 years! Teaparker's latest book about tea storage has generated several questions about which tea to store in which jar. Then, just after Christmas, Teaparker demonstrated how a 6 year old Oriental Beauty would change and improve after just 18 hours in a glazed porcelain jar. 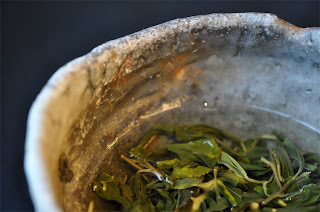 The same leaves would not just smell finer, but also taste smoother after staying in the jar overnight (compared to those that stayed in the original plastic foil). Yesterday, I nearly emptied a pack of 100 gram of my Spring 2006 medium roasted Wenshan Baozhong, the Qizhong Oolong in these 8 jars. 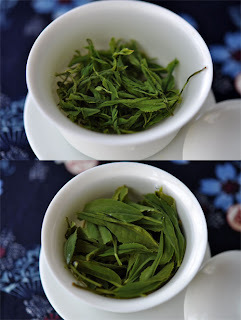 The stripe-shaped dry leaves have more contact with air and this should mean that they should be impacted faster by the storage in a near empty jar than rolled Oolong. Indeed, today the fragrances in the jars were noticeably different. And, brewing leaves from each jar also confirmed that the taste had been impacted by this short term storage. 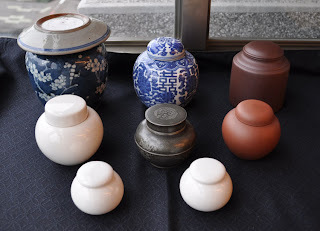 Notice that the Japanese pewter jar has 2 lids to close the jar extra tight. Notice also the 2 mini jars at the bottom. The one on the left has an shiny plastic foil wrapped inside the lid, while the jar on the right has no such foil. - Plastic foil storage: greener, fresher, rougher, less refined feeling. - Mini jar, no foil inside: perfume like scents, more refined, smoother taste. Intense and sweet. Excellent. - Mini jar, with foil inside: greener than without the foil, but also lacking intensity and aftertaste. 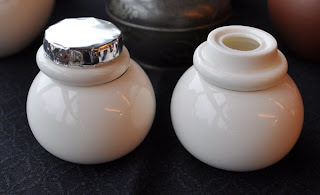 - The other 3 porcelain jars with porcelain lids (no foil): very similar to the mini jar. Small variations seem to be more due to different ratio of leaf to volume in the jar, but nothing very striking. 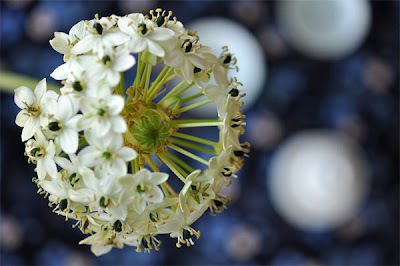 - The pewter jar: freshness and 'greenness' come out even more than from the foil. However, the tea tastes finer. Less sweetness, more salivation. 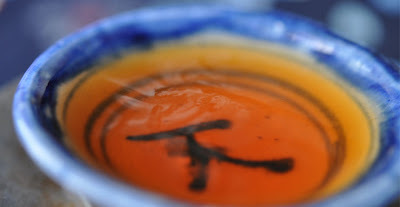 - Small Yixing zisha jar: Fragrances and tastes have been absorbed to a degree. It feels weakened rather than refined. The tea doesn't taste so fresh, but feels 'greener' in the sense that the roasting is somewhat erased. When cold, I also noticed bitterness in the taste. 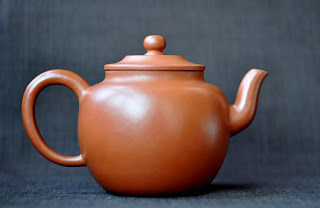 - Bigger Yixing zisha jar: I noticed the jar still carried an unwanted storage smell. It needs further cleaning and drying before it can be used properly. 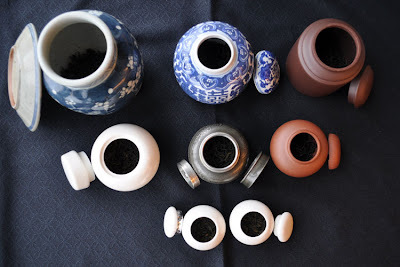 Major Conclusion: Porcelain jars were the best match to store medium roasted Baozhong (and most probably Oolong, too). 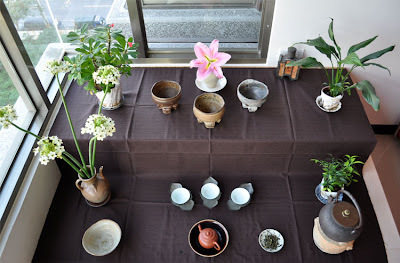 They clearly helped refine and smoothen the fragrances and taste of the tea. However, the plastic foil that wraps the inside of the lid of the jars in my selection has an adverse effect on the tea. It may help to protect the lid during transportation, but I strongly advise that you remove it after you have received your jar. (It only takes a couple of minutes with a sponge and water). I'm not sure this counts as a New Year Resolution, but, from now on, I'll brew my roasted Oolongs and Baozhongs only after having them stored in a porcelain jar for some time! This shows that using a jar for a Cha Xi isn't just about aesthetics, but that the right storage for the right tea will improve the tea. Ce vieux Baozhong provient d'un marchand torréfacteur. Il s'agit d'un mélange de plusieurs récoltes des années 70 avec une majorité des feuilles datant de 1976. "J'ai introduit cette dégustation par une petite présentation de ce thé, illustrée par les articles de ton blog. J'ai choisi un set à déguster en y déposant 5g de thé. J'y ai associé 2 tasses en porcelaine plus fine, de forme et de différente contenance afin d'être à l'écoute d'une subtile modification de saveur ! Il est vrai que je préparerai avec plus d'attention et de précision ce point la prochaine fois car je découvrais en même temps que mes deux invités ce Baozhong... je n'avais donc pas de repères précis ! Pour compléter le tout, nous avions en perspective finale les magnifiques créations chocolatées du traiteur japonais Sadaharu Aoki, présents de mon amie : les bonbons de maquillage, aux parfums de Earl Grey, de Sésame, de Wasabi, de Yuzu, de Framboise, de Coco, de Caramel etc ...., les truffes au chocolat et au caramel-beurre salé, recouvertes de poudre de matcha et la tablette de chocolat au matcha et au sésame. Nous avons réalisé 6 infusions, en allongeant les temps d'attente entre chaque infusion : de 1 minute à un peu plus de 5 minutes environ pour la dernière. - Feuilles sèches : parfum de fruits confits, figues sèches, raisins secs, abricots secs, le tout très sucré. La torréfaction est imperceptible. - Feuilles infusées : nous sommes toujours en présence des fruits pré-cités, mais cette fois-ci accompagnés par l'odeur de la torréfaction. Nous avons finalement "vidé" ce Baozhong de sa substance, de son corps, de "la pesanteur" des années, en espaçant les temps d'infusion. Ce fut très intéressant de tester chacune des infusions simultanément dans les 2 autres tasses : la céramique plus fine de ces dernières renforçait la saveur de la torréfaction, accentuée également par la petite taille de la plus petite tasse, qui concentrait ce type d'arôme, le positionnant au premier plan devant celui des fruits secs. Voilà quel était le programme d'un après-midi, sollicitant tout nos sens comblés, autour d'un thé délicieux, avec des personnes chères à mon coeur!"